The innovative adaptation to reduce dust created by mechanical bedding machines was amongst an array for feeding, bedding and materials handling equipment at the event organised jointly by KUHN and agricultural and amenity machinery dealership Farol Limited. 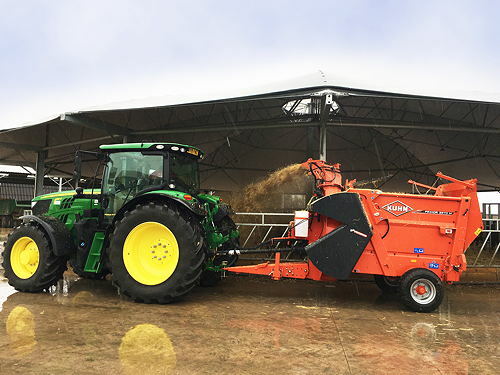 The Cleanstraw system, developed by KUHN and shown fitted to the company’s Primor 3570 M bedding machine, applies a fine mist of water to straw as it leaves the directional chute, significantly reducing airborne particles that can cause respiratory problems. It was important not to underestimate the impact that a dusty environment can have on both livestock and anyone working in sheds when bedding is in progress. Applying a mist of water at this rate preserves the straw’s absorbency potential whilst eliminating excessive levels of airborne dust by reducing the amount of time that these particles remain suspended in the air. Trials have shown that the air in a typical livestock building will be dust-free within 30 seconds after straw-bedding with the Cleanstraw system has ceased, compared to several minutes under normal conditions. The system is available on KUHN’s Primor straw bedders that operate with the Polydrive hydraulically disengageable belt system that drives the feed rotor, and on the Profile Plus range of mixer wagons that have a bedding capability. The system is automatically activated when the Polydrive is engaged and can also be armed or disabled via an in-cab switch. Also on display at the event, held with the kind permission of David Shelton of Shoby Priory Agriculture, Saxelbye Top Farm, were a range of KUHN diet feeders and Kramer materials handlers.